EconoSpeak: Unpuzzling the Politics of Growth and Redistribution: What hath growth wrought? Unpuzzling the Politics of Growth and Redistribution: What hath growth wrought? "If there is a future for cosmopolitanism in Europe, it needs a credible politics of growth and redistribution." -- Peter Dorman, "Europe, Where Two Rights Make a Wrong"
Sandwichman wonders how such a politics would differ from the "ostensible socialist" wing of the neoliberal coalition. First, it would help to have a credible definition of what it is that is supposed to be growing. "Growth" sounds good... as long as you don't have to pin it down. But what supposedly grows -- national income and product accounts -- is an incomplete, monetized aggregate of disparate things, some of which are double counted, and "more" of which could mean just about anything or nothing. It is wishful thinking to assume that more of "whatever" will inevitably be better than a well-specified less. But the hard fact is that there is lots more data out there on many aspects of economics, including the precise issues that Kuznets was studying when he made his complaint about "speculation." To summarize, this analysis shows that world income inequality worsened dramatically over the past two centuries. ... Changes in inequality within countries were important in some periods, most notably the drop in inequality within European countries and their offshoots in America and in the Pacific during the first half of the 20th century. In the long run, however, the increase in inequality across countries was the leading factor in the evolution of the world distribution of income. ... World inequality seems to have fallen since 1950 as a result of the pronounced drop in international disparities in life expectancy. But now that disparities in life expectancy are back to the levels before the big divergence of the 19th century, this source of convergence has lost its influence. ...a long-term constancy, let alone reduction, of inequality in the secular income structure is a puzzle. For there are at least two groups of forces in the long-term operation of developed countries that make for increasing inequality in the distribution of income before taxes and excluding contributions by governments. ... What is particularly important is that the inequality in distribution of savings is greater than that in the distribution of property incomes, and hence of assets. ... Other conditions being equal, the cumulative effect of such inequality in savings would be the concentration of an increasing proportion of income-yielding assets in the hands of the upper groups -- a basis for larger income shares of these groups and their descendants. The puzzle is solved because there isn't "a long-term constancy, let alone reduction, of inequality in the secular income structure" after all. This is not to say that the relationship between economic growth and inequality is an uncomplicated one, wholly determined by the disproportion of savings between people in different income groups. But it does fundamentally undermine the conclusions of cross-country regressions, "on the basis of which," as Bourguignon put it, "it would be tempting to conclude that 'growth (of any nature) is good for the poor'." But what about a politics of economic growth (of any nature?) and redistribution? It might work -- just as a politics of general copulation could reduce the birth rate if combined with effective measures of contraception. Long live the revolution, indeed! On the other hand, why make redistribution conditional on achieving growth targets in the first place? In bargaining parlance, that is what's known as a fall-back position. You don't present your fall-back position in your opening proposal. That's called "giving away the farm." A few days ago, Sandwichman promised to expound on why the perpetual fallacy mantra even matters. Here is why. Those FT monkeys (covered in banknotes) would simply prefer to rhetorically prohibit the only opening gambit that could force real concessions from the folks who have champagne and brandy on tap. That effective initial offer would be a demand that doesn't stupidly assume, but actively pursues a "fixed amount of work" with a more equitable distribution. The only "credible politics of growth and distribution" would put distribution first and leave it to the owners of a disproportionate share of income-yielding assets to offer a growth and redistribution compromise in their counter-proposal. But, alas, those FT monkeys' strategy seems to be working. They think about nothing but screwing growing their income-yielding assets and we are the ones who get screwed yielded. The Del Mar Inn, Vancouver, B.C. : "UNLIMITED GROWTH INCREASES THE DIVIDE"
"The strategy behind 'Unlimited Growth...' is direct. It is directed at those who operate our free-market economy in their own interests, while excluding those interests that would be 'responsive to the needs of the community'. 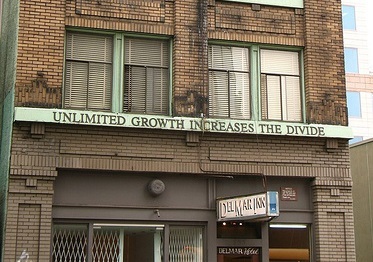 The subtext to 'Unlimited Growth...' relates to several aspects of public art including the need to address the use of site-specific work as a way of intervening in local issues, and in this instance, acting as a marker of resistance by the economically marginalized, as represented by a parallel gallery and a hotel providing affordable housing. Walter raises questions related to the systems underlying the transactions and power-plays that constitute normal business in the world of real estate development. In Walter's art the museum without walls is also a museum OF walls, walls new and old, as well as those walls that perpetuate economic class distinctions. Her text on the façade of the Del-Mar Hotel will stand as a witness to the various power-plays, including the threat to move B.C. Hydro's head office to the suburb of Burnaby, that led to the development surrounding 553-555 Hamilton Street." One of the drivers of flawed economic thinking in general, and with regard to growth specifically, is a deeply cynical view of human motivation. An Internet commenter once argued that black parents don't care for their children properly because widespread racism makes it unlikely the child will have enough money to care for the parent in old age, no matter how well the child was raised. Call it the ugly implications of utility. Thankfully, real humans are nothing like homo economicus nor the Econs who invented him. Here's a great portrait of a real estate developer with the soul of an artist. I believe him when he says "It's not about the money." Since it looks like I am being taken to task for "taking me [you] to task," let me note that I do not think Piketty is guilty of the sins of Bourgignon and Morrison, whose paper is kind of old, if I am not mistaken. It is true that Piketty has a half-baked model in which a higher growth rate will tend to reduce (or at least restrain) capital share, but a) this has been pretty much debunked by everybody from Austrians through Greg Mankiw to Jamie Galbraith, and b) Piketty himself says that politics and institutions are more important than his much-publizied inequality involving the rate of return on capital and the growth rate. What Piketty deserves credt for, and it was all I was referring to in my post, that said not a word about his goofy theoretical model, is the quality and quantity of data that he has gathered on the history of income and wealth distributions. This is an astounding effort, and nobody has matched it, and it deserves nothing but praise. The handful of people who have attempted to challenge him on his data have either found only tiny errors of no importance or just plain totally fallen flat on their faces humiliating themselves and their sponsors, most notably in the latter case, Paul Giles of the Financial Times. "Bourgignon and Morrison, whose paper is kind of old, if I am not mistaken." Depends -- if you think 2002 is "old". I don't follow what you mean by the "sins" of Bourguignon and Morrisson. I'm not taking you to task for taking me to task. You made a perfectly reasonable objection to my assertion. If there was anything to take you to task for it was only providing Piketty as representative of the enormous influence of empirical work. I think you are going way off topic about Piketty. My posts are about growth and inequality. At least some of the empirical work supports the observation that growth is correlated with increased inequality. Kuznets was puzzled that his evidence showed a reversal even though a simple model would suggest a causal relation between growth and inequality. Subsequent empirical work -- at least some of it, including Piketty's -- would lend support to the hypothesis of Kuznets simple model and contradict his tentative initial findings based on "5% fact and 95% speculation". All I'm saying is that the growth policy mantra rumbles on as if there was nothing... NOTHING! to lead one to question the assumption that "growth (of any nature) is good for the poor." Are you trying to prove my point by going off topic? If you know of empirical work that definitively supports the assumption that "growth is good," CITE it and summarize it. And, no, evidence that "no growth is bad" is NOT the same as evidence that "growth is good." "There are only two long-run empirical historical studies of global inequality. The first and seminal work was done by François Bourguignon and Christian Morrisson in their 2002 American Economic Review paper which estimated global inequality from 1820 to 1992. ... Although their approach was in several respects less than ideal, it was, at that time, perhaps the only possible since historical income distributions are so scarce." How much wealth would be produced in the month of July, if everyone who depended on selling their labour power to an employer for wages went on general strike? Why don't the producers of wealth socially own and democratically control what they produce? The producers of wealth need growth in their free-time. They won't get it from their masters in the employing class for while the bourgeois may know the prices of all the commodities produced by wage-labour, the bourgeois knows the use-value of nothing. OK, Sandwichman, let us view B-M as being pure as the driven snow, although I do not see them critiquing or caveating the use of growth of GDP in the way I think you wish to do (and which I am sympathetic with). So, let us stick with conventional GDP measures. They argue that since 1820, growth has done more to reduce poverty than income redistribution, and the inequality-growth relation is compliicated, with high inequality countries tending to become more equal as they grow, while low inequality ones tend to become more unequal as they grow. I am not going to argue with them. Certainly it is true that if one holds income distribution constant, then growth will reduce conventionally measure poverty. This is simple math. In the more reecent era (since WW II at least) I see the growth-distribution issue as pretty messy and noisy. OECD has just come out with a study arguing that among the high income OECD countries, growth has been held back by rising inequality in the last 30 years. I suspect this is true. One can also point to such obvious examples as much of East Asis growing more rapidly with less ineqaulity than Latin America in recent decades. But, there are plenty of outliers on all this, with China at the top of the heap, very rapidly growing with massively rising inequality. In general on the global data base, the US also looks like an outlier, and Africa is very confusing with extreme cases in all directions going every which way. So, none of this is straightforward and depends on a lot of other things. "So, none of this is straightforward and depends on a lot of other things." Which is actually EXACTLY my point, Barkley. I'm not saying Kuznets's simple model of "the concentration of an increasing proportion of income-yielding assets in the hands of the upper groups" holds, regardless. What I'm saying is the complacent assumption that "growth (of any nature) is good for the poor" doesn't hold, is not supported by evidence and has no theoretical grounding. Therefore the starting point for a discussion of what to do about inequality cannot be subordinated to the priority imperative of growth. My position, all along, has been to argue AGAINST an institutionalized taboo on alternatives that turns a blind eye to the fact that "none of this is straightforward and depends on a lot of other things." "Certainly it is true that if one holds income distribution constant, then growth will reduce conventionally measure poverty. This is simple math." What?!! It is equally simple math -- perhaps even simpler than yours -- that if one holds income constant and redistributes it in equal share, the redistribution will reduce poverty, measured in relative terms. To even suggest such a thing would be to commit a heinous offense against the fallacy nazis. Shhh... John! Do you want people to think it's all about making the world safe for usury? Ah, so B-M are sinners after all. Of course I agree that holding income constant, reducing inequality will reduce poverty. Mahybe I'm dense but I don't get this "sins of B&M" thing. No, I don't agree with every thing they say or accept their framing uncritically. But, yes, the evidence they produce is evocative and useful, even if a lot of it is extrapolated and thus requiring caution and tentativeness. An carefully-informed guess is better than a wild guess.